You’ve seen “trolleys” crop up in other places for sure. They’re buses dressed up to look like “the streetcars of yore” or something, and I’ve never met anyone who finds this to be cute. The idea is that they provide a cheap or free way to quickly and easily get around a dense and compact area. That’s a promising idea, and the trolley concept may make some sense in cities where it aesthetically makes sense and where there’s no better way to provide such a service. Enter Miami, where I guess our government is running in me-too mode, and our own trolley, running for about four months and now being promoted by an oversized mailer that arrived at my door yesterday. Notice anything about the route? Yep: it’s almost exactly contiguous with the Metromover route. Remember the Metromover? That thing that’s a free way to quickly and easily get around downtown? That thing that actually is fun (I see tourists on there all the time, and everybody loves it) and actually does aesthetically fit Miami’s style? Why on earth do we need the trolley? And why on earth is it painted green and orange and have the same goofy decoration that every trolley service in the country seems to have? 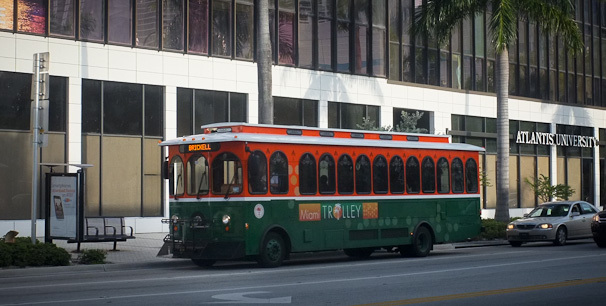 There’s a second trolley route that runs between Jackson Memorial and the new Marlins Stadium that makes some sense, but you wonder why they’d go with the uncomfortable and ugly trolley concept instead of, say, nice mini-busses like the South Beach Local uses. But you know what really irks me about all this? It’s the thought that it’s money that could have gone to developing the Miami Streetcar project. That was actually a sound idea: expand the Metromover with street-level trains that’d run further up and down Biscayne Boulevard, Midtown, Wynwood, Overtown, and the Jackson medical district. It was last heard from being pushed from 2008 to 2010, and now it’s a distant memory. Instead, we’ve got this pathetic trolley. And it’s not that I think the trolley is completely useless, or that it won’t find a ridership. It’s just that it reflects our worst tendencies: our desire to take the politically and intellectually easy way out, and ignore the long-term problems and needs that are clear to see but challenging to address.